With FutureDecks PRO you can mix songs and videos like a pro DJ. Beat-matching, seamless beat-aware loops, external controllers and MIDI support, VST effects, precise automatic BPM counter, sampler, karaoke support and many more. Features:- automatic/manual mixing- one-click beat-matching.- seamless intelligent looping- automatic BPM counter- keylock, VST/AU effects, eqs, filters, sampler, video, karaok, etc. ...... seamless intelligent looping and "skipbeat"
Qweas is providing links to FutureDecks Pro 2.0.3 as a courtesy, and makes no representations regarding FutureDecks Pro or any other applications or any information related thereto. Any questions, complaints or claims regarding this application FutureDecks Pro 2.0.3 must be directed to the appropriate software vendor. 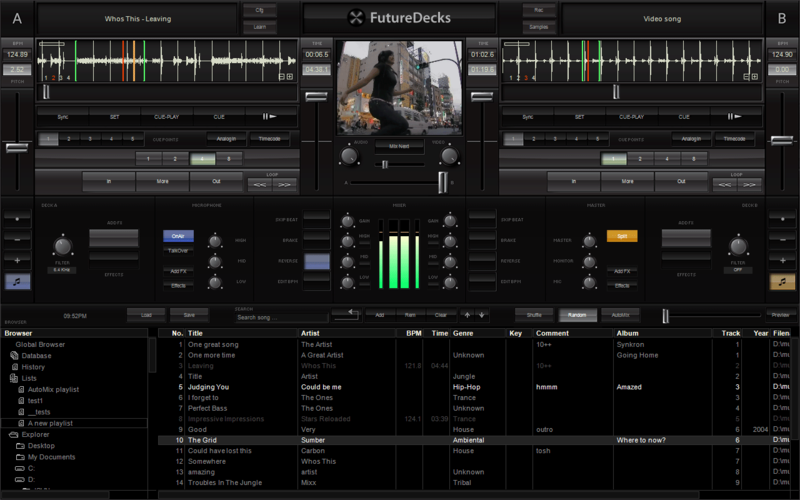 You may click the publisher link of FutureDecks Pro on the top of this page to get more details about the vendor.